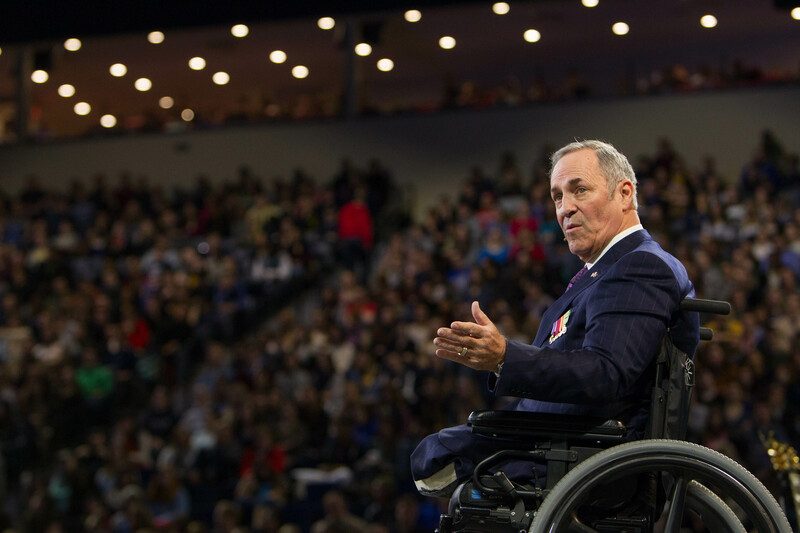 Liberty University President Jerry Falwell announced that war veteran, evangelist and Liberty board of trustees member Tim Lee will be the keynote speaker for the 2016 Baccalaureate ceremony, May 13. Born in 1950 to a Baptist minister John and his wife Wanda, Lee joined the Marine Corps in 1969. The Illinois native was sent to Quang Nam Province, Vietnam, according to timlee.org. Two years later in 1971, a land mine detonated and severed his legs, rendering him confined to a wheelchair for the remainder of his life. However, God would have it that this day would change his life forever, in more ways than just one. In the middle of all the calamity and chaos, Lee prayed to God and promised he would do whatever God wanted him to, so long as he could return to his parents. God answered his prayer, and Lee has dedicated his life to ministry ever since. Now, Lee uses his tragedy and experiences in the Vietnam war, along with the story of his recovery, and takes it to others to spread the Gospel. The friend of Liberty has spoken at its campus on multiple occasions, including Convocation and Military Appreciation Week. A champion for soldiers and proud proclaimer of the faith, Lee currently heads Tim Lee Ministries, based out of Garland, Texas. “Tim has been a loyal friend to Liberty University and to the Falwell family for many years and we are honored by his dedication to Liberty since he joined the Board of Trustees in 1994,” Falwell said.